Rachel Khoo was determined to get to grips with French cooking, so to learn more she moved to Paris, not speaking a word of French, and enrolled at Le Cordon Bleu, the world-famous cookery school. From a Croque Madame muffin and the classic Boeuf bourguignon, to a deliciously fragrant Provencal lavender and lemon roast chicken, Rachel celebrates the culinary landscape of France as it is today and shows how simple these dishes are. The 120 recipes in the book range from easy, everyday dishes like Omelette Piperade, to summer picnics by the Seine and afternoon 'gouter' (snacks), to meals with friends and delicious desserts including classics like Creme brulee and Tarte tatin. It's a book that celebrates the very best of French home-cooking in a modern and accessible way. In The Little Paris Kitchen, Rachel Khoo serves up a modern twist on classic French cooking. After graduating from Central Saint Martin's College with a degree in Art and Design, British food writer Rachel was lured to Paris to study patisserie at Le Cordon Bleu. 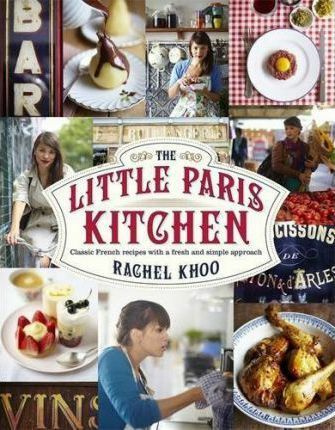 Rachel shot to fame when her TV series, The Little Paris Kitchen, was broadcast by BBC. Her beautiful tie-in cookbook and the follow up, My Little French Kitchen, have been published around the globe. Rachel now travels the world working on a variety of projects, including a weekly recipe column for the Evening Standard. After graduating from Central Saint Martin's College with a degree in Art and Design, British food writer Rachel was lured to Paris to study patisserie at Le Cordon Bleu. Rachel shot to fame when her TV series, The Little Paris Kitchen, was broadcast by BBC. Her beautiful tie-in cookbooks have been published around the globe. Rachel now travels the world working on a variety of projects, including a weekly recipe column for the Evening Standard.